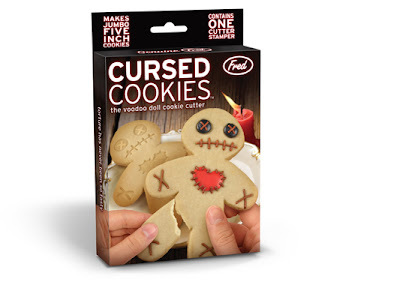 This "Cursed Cookies" kit includes a voodoo doll cookie cutter. 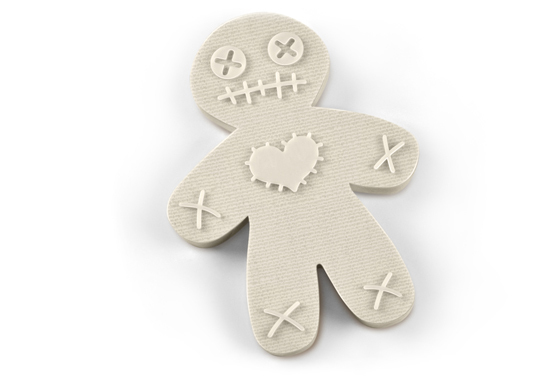 Once your cookie is cut out, you turn the cutter over to stamp the doll's features. (I recommend chilling the dough cutouts for at least ten minutes before baking, so the designs will stay put when you bake the cookies). Decorate with red frosting, and stick red toothpicks into the voodoo doll cookies in appropriate places. Serve with a cheerfully malicious grin.